Northumberland contains some of the most iconic sights in England – the castles of Lindisfarne, Bamburgh and Alnwick as well as Hadrian’s Wall. The breath-taking beauty of the National Park and the area’s stargazer-friendly dark skies make this a perfect family getaway. 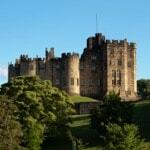 Northumberland is made for cottage holidays too and Cottages in Northumberland are the specialists. As you will already have gathered, we specialise in holiday lettings in Northumberland. It’s our heartland, our favourite place on earth and we have selected more than 200 wonderful cottages with family holidays in mind. From one up to five bedrooms, we’re confident you will find something to suit your family, whether you are looking to stay on the stunning coast, the Northumberland National Park, the North Pennines AONB or even a stay in the vibrant city of Newcastle upon Tyne. Northumberland is a haven of natural beauty, perfect for outdoorsy families who like to explore, picnic on the beach, go rock-pooling and clamber up hillsides for the best views – with a cosy pub supper, fish and chips on the sea wall or a barbecue back at your cottage at the end of each day. You will also find a wealth of fascinating history in Northumberland with castles galore, including Alnwick Castle which dates back to the 14th Century and doubled as Hogwarts in the Harry Potter films. We also love to beat the tide and explore the offshore island of Lindisfarne, known as Holy Island, for a wonderful day out. You can find more ideas of what to see and where to go in our guide. 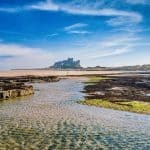 The coastline of Northumberland is known for its vast swathes of golden sand, and characterful seaside towns and villages such as Bamburgh, Craster and Alnmouth. Many of our selected properties are virtually on the waterfront – discover our coastal cottages. 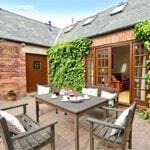 We also have a wide choice of dog-friendly cottages – this is top dog-walking territory! – and some of our properties have access to a swimming pool on site or their own hot tub. If you are thinking of a weekend or shorter half-term break, we offer a wide range of options for short breaks. Explore our full range of family-friendly cottages in Northumberland.